“All roads lead to Mayweather,” his Moneyness is fond of saying. The road trekked by Marcos Maidana has been long and hard, featuring crushing disappointments and inspiring, even surprising triumphs. His story reads like a Hollywood script. A rough and rugged Argentine fighter who spends years trudging and struggling in obscurity is suddenly thrust into the spotlight courtesy of murderous power in both hands and an unearthly toughness that would make the late great Arturo Gatti blush; and just like a Tinseltown scribe would pen, that long, hard and brutal road leads to the biggest name in sports and the greatest boxer of the age, Floyd “Money” Mayweather, Jr.
No matter what the cynics spew this fight makes the most sense in every conceivable way. First, Marcos Maidana is the right choice and very much deserves this shot. True, others like Erislandy Lara and Danny Garcia have definitely scored performances worthy of a dance with Floyd, but, let’s keep it real Marcos Maidana is simply the better story, he has more than paid his dues, in addition to posting those huge and unexpected wins. Maidana was not even in the conversation a year ago as a potential foe for Mayweather. That in and of itself is astounding. He got to this point legitimately, no promotional hype needed, just his fists. Second, thanks in large part to Marcos Maidana’s last performance and of course, Mayweather’s star power, particularly his ability to seduce his many detractors into dropping that hefty Pay Per View fee in hopes of him losing, this will likely rank among one of Mayweather’s greatest Pay Per View events. It reeks of that feel good, underdog tale fight fans and mainstream fans the world over can’t get enough of. The stoic, hard luck journey man done-good, versus the very embodiment of American brash and excellence. Lest we forget, Mayweather himself has traveled an arduous road of his own, and despite his renowned swagger, braggadocio and wealth, he approaches his craft as one with everything to lose. Finally, Maidana brings a dangerous presence that belies his record. He’s not built to merely fade away even against the wondrous ability of Floyd Mayweather, Jr. This will be a fight worth watching and its questions are glaringly obvious. What happens if Mayweather feels Maidana’s power? 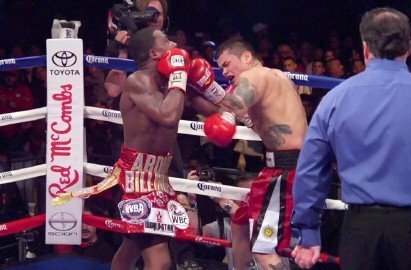 What happens when Maidana realizes Mayweather is not Broner, he’s the original make and model? Speaking of the once heir apparent, Adrien Broner, news of El Chino’s big break appears to pose a problem (pun intended). Win or lose, especially win, redemption vs. Marcos Maidana is out of the question, all thanks to his idol. May 3rd and the events leading to it are bound to generate the excitement expected of a Mayweather fight; and whatever the outcome, Marcos Maidana’s hard fought journey proves that sometimes good guys do finish first and in this case, might even win. Now that would certainly be the stuff of a Hollywood ending.